Director of the provincial Department of Culture, Sports and Tourism Nguyen Hong Hai said this year’s festival themed colourful flowers on the stone plateau will include a variety of activities, such as a photo exhibition on the Dong Van Karst Plateau Global Geopark, a re-enactment of the old market in Dong Van town, demonstrations on the production of the local honey specialty, and a flower road in Dong Van ancient town, among others. More activities are planned in the neighbouring Meo Vac district, notably a night market with folk music performances, a photo contest and a mountain climbing competition on Ma Pi Leng pass. Along with Dong Van and Meo Vac, other districts in the province such as Quan Ba and Yen Minh will host cultural activities highlighting traditional crafts, cuisine and experiment tourism. Tran Duc Quy, Vice Chairman of the provincial People Committee, said the festival, which has been held since 2015, has greatly contributed to the socio-economic development of the province. The festival this year will be the largest so far as the province will review four years of the programme on tourism brand building for Dong Van Karst Plateau, he noted. 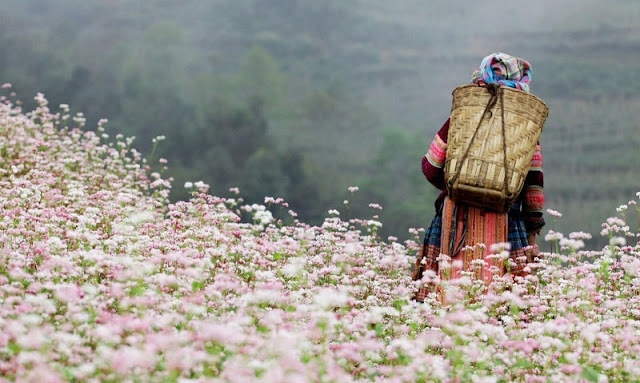 Beautiful fields of buckwheat flowers, framed by magnificent limestone mountains, have become a highlight attraction for tourists in Ha Giang province in recent years. The province hopes to draw more tourists by showcasing its natural attractions. Thousands of tourists are expected to attend the one-month event, which will run until the end of this year. The crop is often planted around September. From late October to early November, large fields of buckwheat flowers are in full bloom, making a spectacular sight. The hills and mountains are covered by the white and pink of the flowers.